This is one of the coolest things I’ve seen in a while. 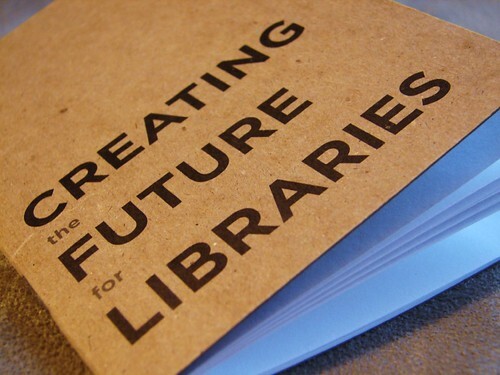 Check out Aaron Schmidt’s new project – Creating (the) Future (for) Libraries. Get yours now while you can – they’re a limited edition run, and they’re beyond awesome. I’ve written before about Rick Bolton and his Library Mini Golf nonprofit that creates 18-hole mini golf courses for libraries to use as fundraisers. This time I’m particularly excited to note that Rick has partnered with the Downers Grove Public Library Foundation in Chicago’s western suburbs to hold the first such event in this area, because DGPL is my home library. 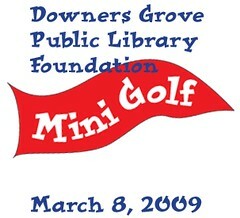 If you’re in the Chicagoland area, I hope you’ll make some time to come play mini golf at Downers Grove PL this Sunday, March 8, from 11:00 a.m. to 5:00 p.m. It’s a fundraiser, so adults can play the whole course for just $5, while kids age 15 and younger can play for $3. Putt your best and if you do well, you might find yourself in a playoff round at 4:15 p.m. Experience the stacks in a whole new way! I can’t wait to finally see this in action for myself, so I’ll definitely be there. Give me a heads up if you’re coming, and we can tee off together. If you live in the area, consider thanking the local sponsors by doing business with them. “…I won’t get into the details of the meeting, but suffice to say I had a choice to make – be silent or speak. You may imagine the choice would be easy for me, but it was not. I too face decisions between easy discontent and uncomfortable action. To stand up invites more work, or derision, and in either case courts conflict. It is just easier sometimes to let things pass. I know I am not alone in having these choices to make. As I go around the country I encounter too many librarians who see the vision, who embrace change, but have grown too tired and discouraged to hope again. They are quieted by the scars of past optimism. These are the conversations that I have the hardest time with. I want to ‘go all inspirational’ and call them to action, but I too have those scars, and have plenty of times when I tried and failed. It is not a good feeling. I would like to avoid it too. So I never want to fault others for their decisions…. It may sound simplistic, but for me it comes down to needing some encouragement. We need to know that we are not alone. We are not. There is a whole pool of fellow librarians that ‘get it.’ We also need to realize that those who get it aren’t just new librarians, but directors, managers, and policy makers. We have a lot of good examples to show the way as well. When I have those bad days, the first thing I have to do is decide to speak up. Then I have to do something. Even if whatever I decide to do is wrong, it is something. Finally, I listen to Shakespeare. Seriously. For some people when they need to get a pick me up it is music, for others a movie, for still others it is ‘the story’ I’ve talked about before (that time that you as a librarian changed someone’s life for the better). But for me, Shakespeare â€¦ Henry V’s St. Crispen’s Day Speech. I have to thank George Needham for introducing me to it…. How do I stay optimistic? I realize first the issues I face are miniscule to the good I can do. How do I get inspired to face intransigence, or laziness, or ineptitude? I look right past them at the real goal, and those who really need me. I think I’m going to print this out and post it above my desk, so thanks for writing this, Dave. And along these same lines, I want to note one other thing about librarians. We don’t get the credit we deserve for leading in the 2.0 world, but more importantly, we don’t give ourselves enough credit. While I always think there’s more we can do, experiment with, and improve, it’s also important to take a step back and survey just how much we’ve done in this sphere as a profession. Librarians were one of the first professions blogging, and by a pretty wide margin. In fact, I’ll even go out on a limb to say that behind the techies, I think we had the largest critical mass first – ahead of the journalists, marketers, lawyers, and other trades that have a large presence in the blogosphere. And in terms of trying out new tools and integrating them into our services, I’d be hard-pressed to find more early adopters in a profession other than librarianship in the areas of instant messaging, wikis, Facebook, and Twitter. We swarm on a new tool and play with it faster than 90%+ of the folks out there, and we’re constantly trying new things. Sure, there’s a wide range of skills and adoption among librarians and only a small percentage are on the front of the bell curve, but the next time you hear someone berate libraries for staying stuck in the past, don’t let them make a generalization. We all need to keep moving forward, but there are a lot of good things happening in the profession, making it an exciting time to be a librarian. Make a wall into a door and keep trying. It’s worth it, and you can make a difference. Over on Museum 2.0, Nina Simon (not Nina Simone – and wouldn’t it be something if this post was sung by her) has a *great* blog post encouraging museums to get human on their Twitter accounts and provide more than just “spammy and dull” tweets. Pretty much everything she exhorts museums to do applies to libraries, as well. Actually, it’s great advice for all types of organizations, including, um, associations and the like. She provides seven broad suggestions, but here are some specific ideas she proposes for “museum Twitter ‘radio stations’.” Just think “libraries” instead of “museums” to imagine what a great stream your library could offer. “Funny things said by visitors. Institutional superstitions or weird things about the building. The imagined experiences of a famous artifact, heavily loved interactive, or other institutional mascot (see this Twitter feed, which I doubt is written by AMNH staff). A daily or weekly feature on a specific topic. Jokes, recipes, quotes, and interesting facts. Do you know why there are naked ladies on the front of ships? Weird and surprising behind-the-scenes victories and challenges. What’s it like to prep an exhibition on poop? Do you know of any libraries already doing this type of tweeting? There are some good examples listed on the very helpful Twittering Libraries section of the LIS 5313 wiki, but I need to go through the whole list. I’m also interested in finding associations doing this well (I’m planning to go through Lindy Dreyer’s list of associations on Twitter).